I have spent several years thinking about becoming a beekeeper and this year I will officially have my own hive. I have followed blogs and read books and talked with several beekeepers about the hobby. I have been supportive in my gardens to feed all pollinators and like any normal person I love honey. So this February I enrolled with about 40 other community members in a Department of Agriculture class titled “Beginning Beekeeping” given through the Lewis County,W.V. Extension Office. The class was what I needed to feel like I can become a responsible beekeeper. One of the wonderful things about the class was to see who also enrolled in the very inexpensive class.They are the faces of people who I see almost everyday,there were farmers, business owners, teachers, retired state employees, gas men, salespeople and few children all eager to learn how to help the bees. It was an equal mix of husbands and wives and families who all felt the drawn to honey and the plight of the bees. 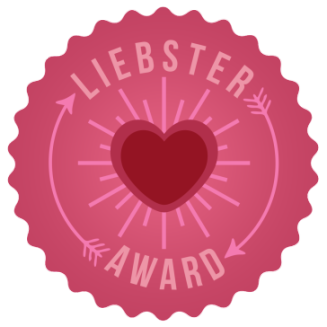 Maybe it was a mixture of love and fear that made all of us trudge to the 4 classes almost 2 1/2 hours long in the cold evenings of February. Living in an agriculture heavy state bees are a serious topic of conversation.My community worries about the future of our farms and orchards with less pollinators . They want education and they want to help bees.The classes were eye-opening for all of us. According to USDA’s 2014 report open pollinated soybean and apples are our state’s 3rd and 4th largest cash crops. Those two bee loving crops produces $25,708,000 dollars of produce for our state’s economy. This is only the information on registered producers who sell for profit. The effects of low bee populations are dramatic when you add in all the other fruit and vegetables that are lower on the list and all the produce from the back yard farmers that sell or give away their produce. It is overwhelming that all of this money rests on the winged shoulders of our bee population.With bees in decline all of us at this class understood the importance of our attempt on a small-scale to help. Honey sweetens the pot for beekeepers who want to also make a profit from caring for the bees. In our class were able to get enough information about bee keeping to think seriously about what we will do with the honey. Our family plans to eat and give away honey with the comb in jars, so we will be doing a more historic and traditional way of processing our honey then many in our class. 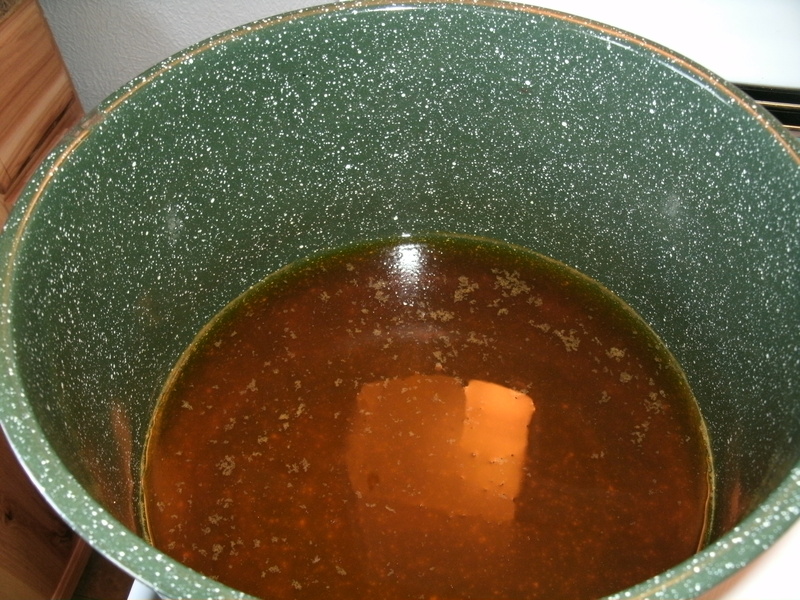 Most members will be removing the honey with a centrifuge system that should make honey production faster and easier. As spring arrives I will be writing more and sharing photos of our last class where all of us beginners will get a hands on chance to open and split a hive, take a look inside the hive and look at the condition of the queen and the comb. It will be just before then that we should have our hive and begin setting it up in the yard. Around the same time our bees should arrive and we will take the first steps in this adventure. I am looking forward to sharing my new hobby with my husband and two sons. If I am lucky maybe they will also see the value in raising these very important pollinators and will see the overall benefits to our family, community and state. If Christopher finds any interest in the bees he can even use them as a 4-H project to educate other kids about bees, honey and how important they are to our world. It is because of all people I call my friends that I think together we can make a difference in our environment one hive at a time. 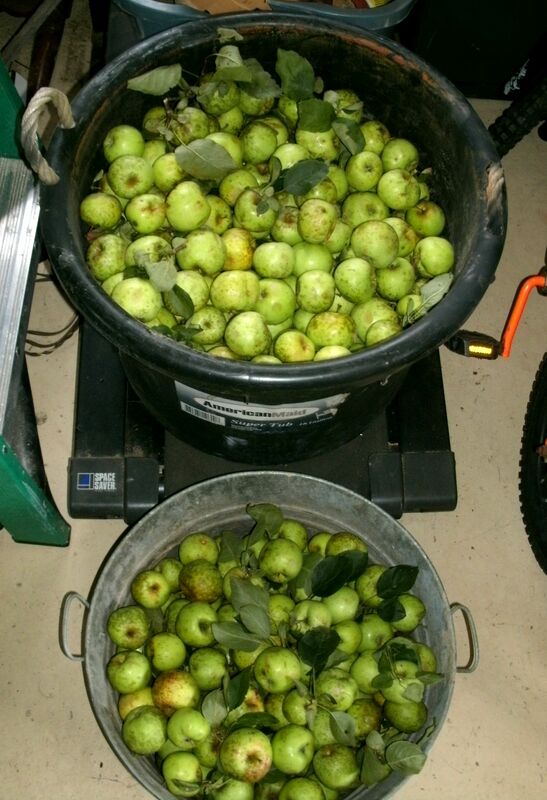 This summer I was so fortunate to receive a gift of about 60 pounds of apples from a neighbors tree. 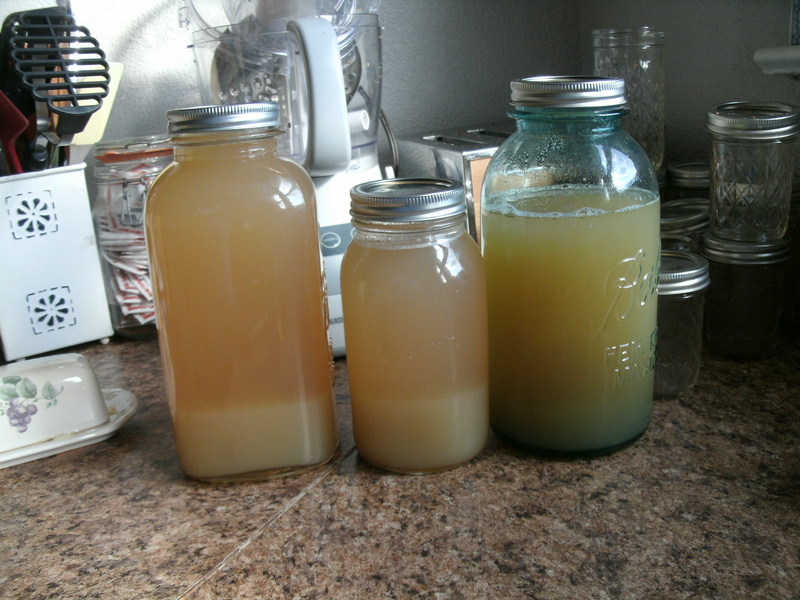 I made several things from the free organic apples, pies, apple sauce, jelly and apple butter. 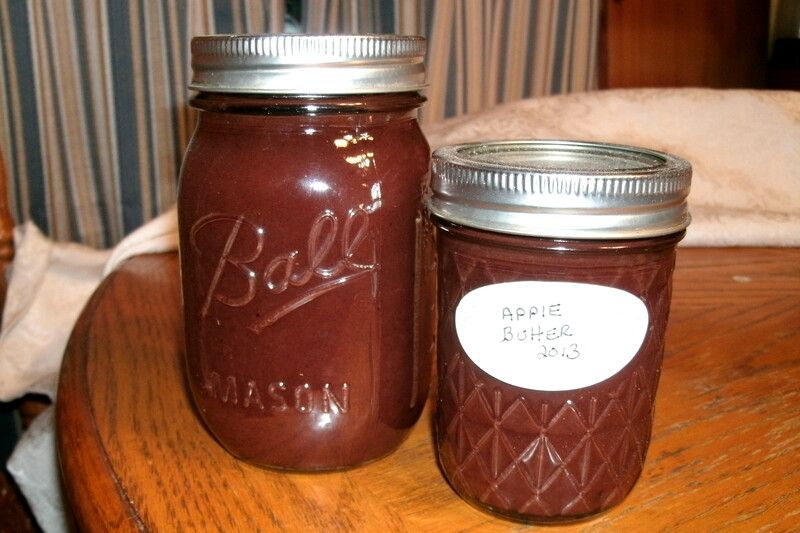 The nice thing was that with the raw apples I could make both apple jelly and apple butter out of the same apples. A two for one deal. I was happy when I realised that all I needed was apple pulp for the apple butter and just the juice for the jelly and they could be worked back to back. If I could just get a whole day to do it all. 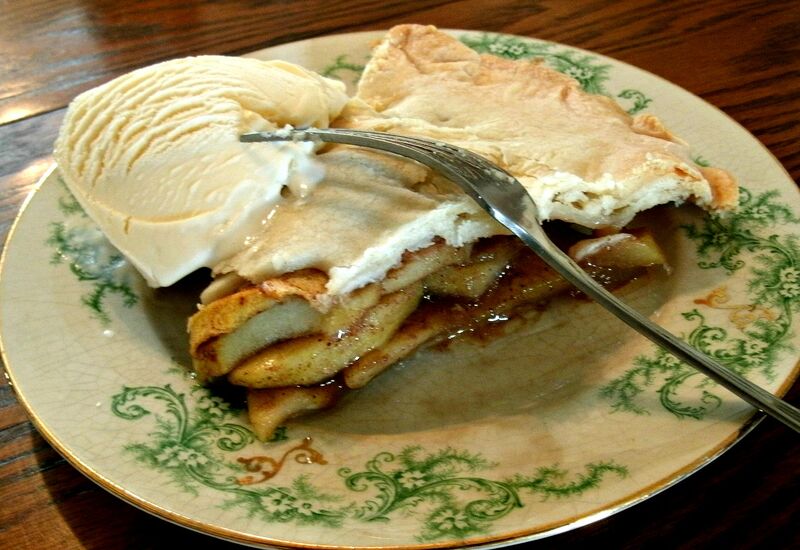 I though about what I needed to do to combine the recipes for both the apple jelly and apple butter. 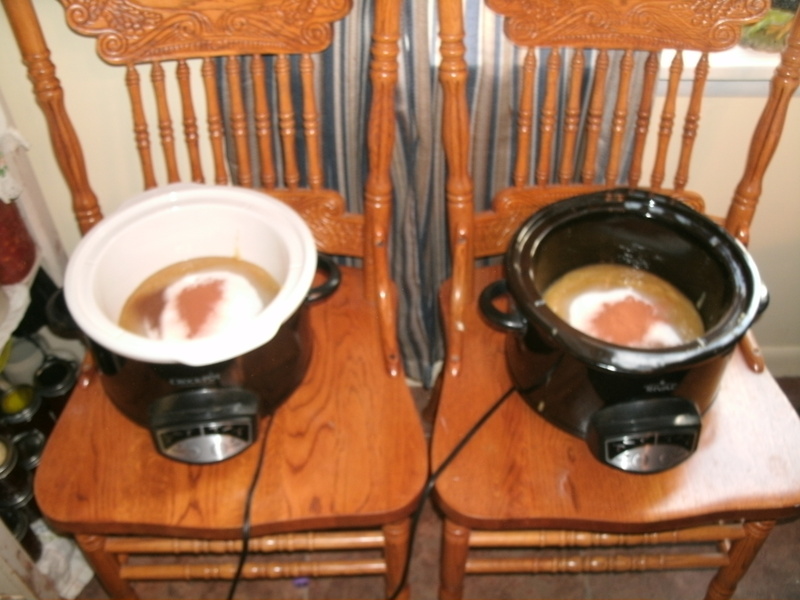 I needed to make a juice or cider then I could make apple butter as soon as I was able to get the apple pulp through the food mill and into the slow cookers. 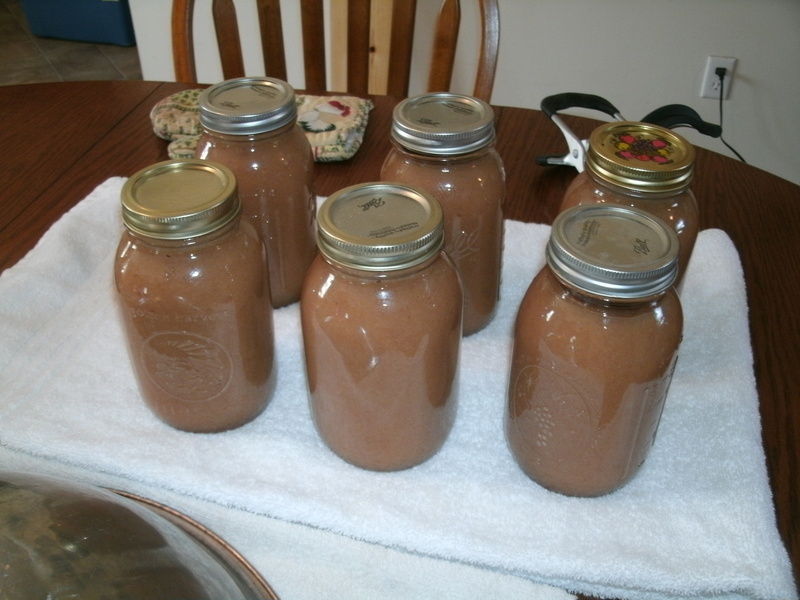 I did use two slow cookers for this batch of apple butter each holding about 2 1/2 quarts of apple pulp. The process is a simple and easy one. 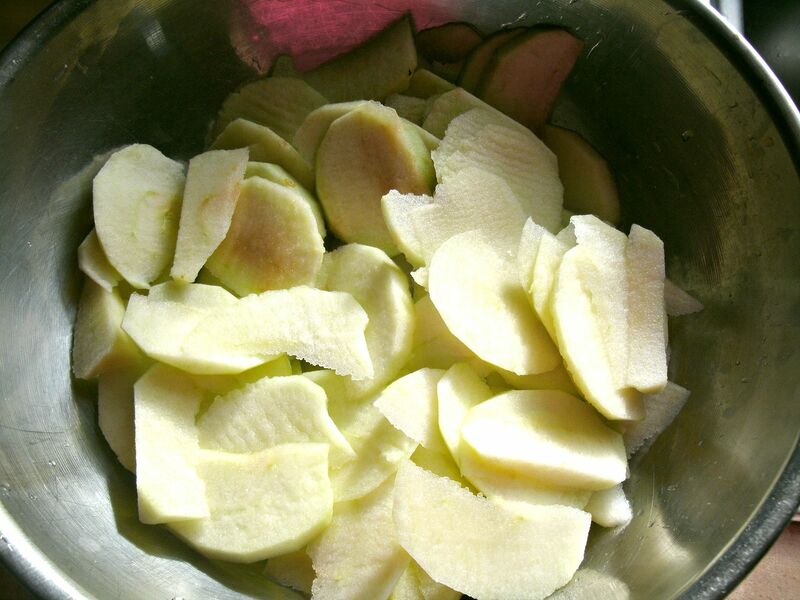 I cut up unpeeled small apples into quarters. 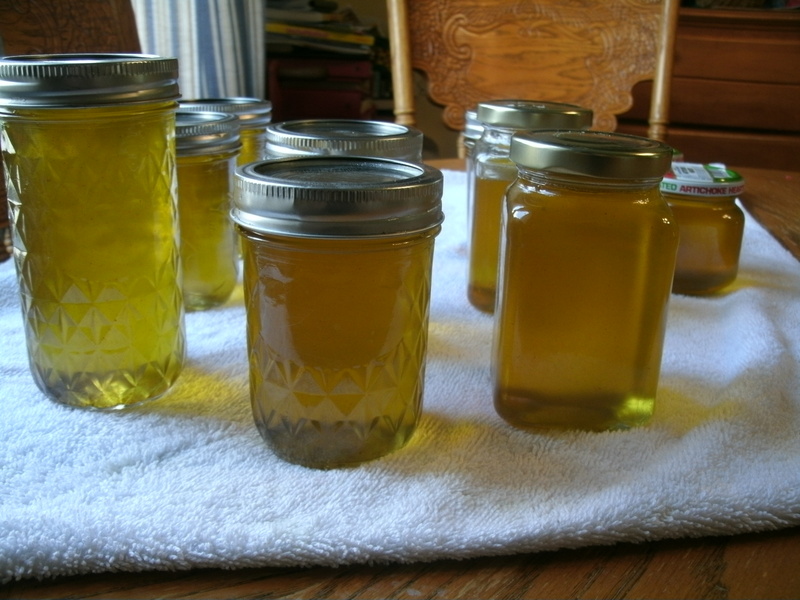 The ones I used for the apple jelly/butter were smaller than the ones for apple sauce and pies. 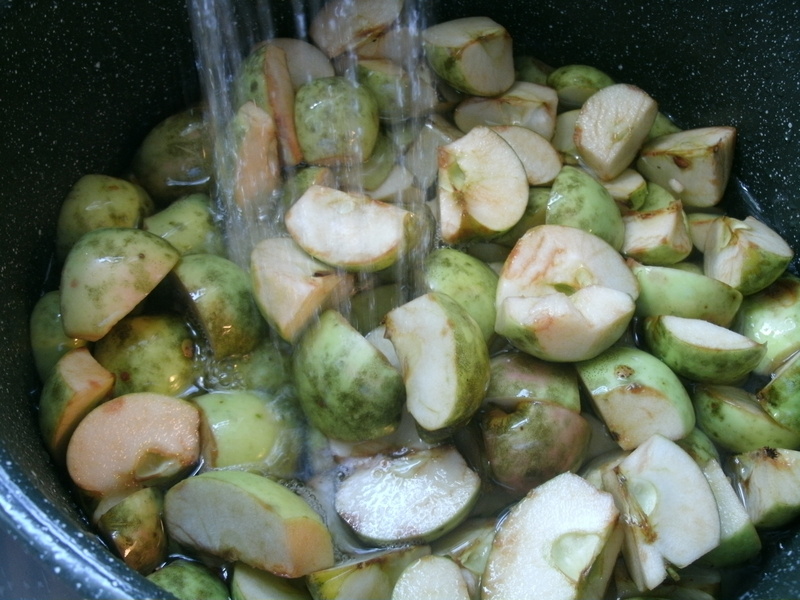 I placed the apples on the stove with about a 3/4 full pot full of water (about 4 quarts of water). Cooking the apples down to a sauce took about 20 minutes. 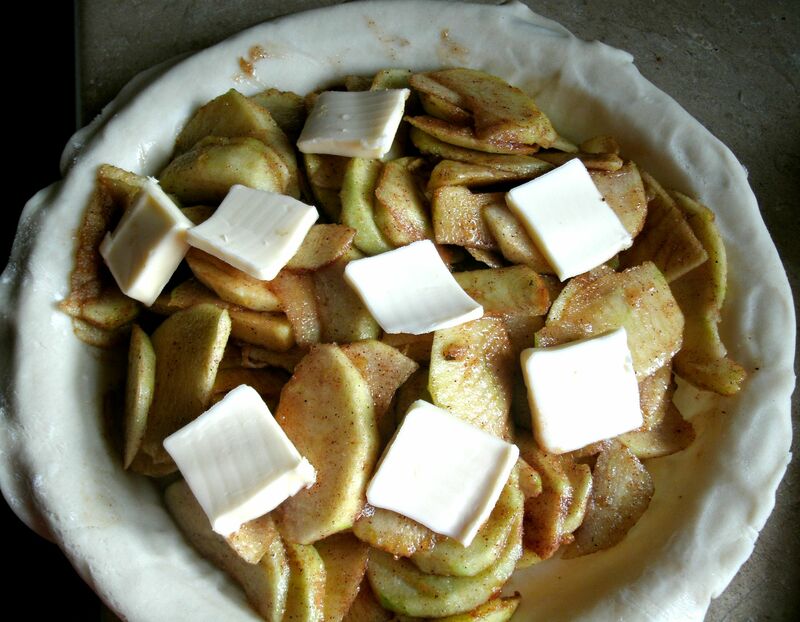 This time I wanted the skins and peals still on as I cooked the apples down. 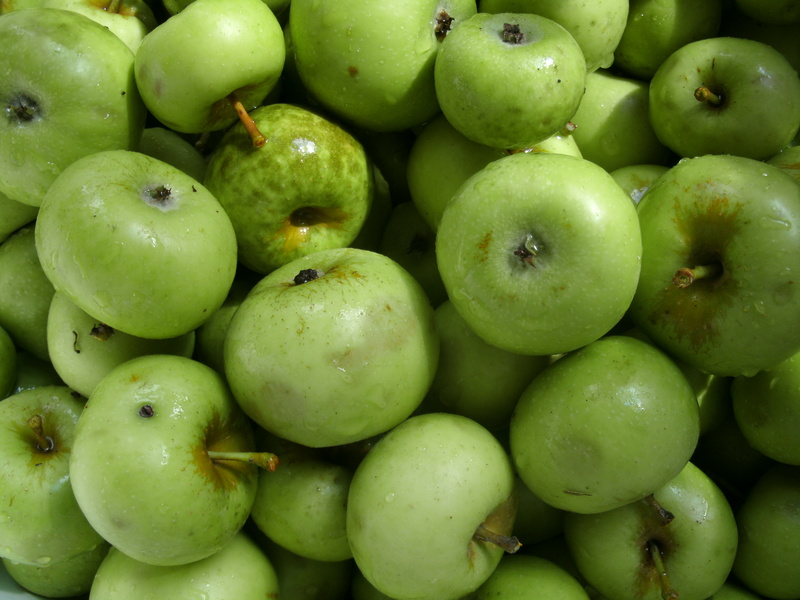 The natural pectin in the apple skins would help the jelly set up later in the process. 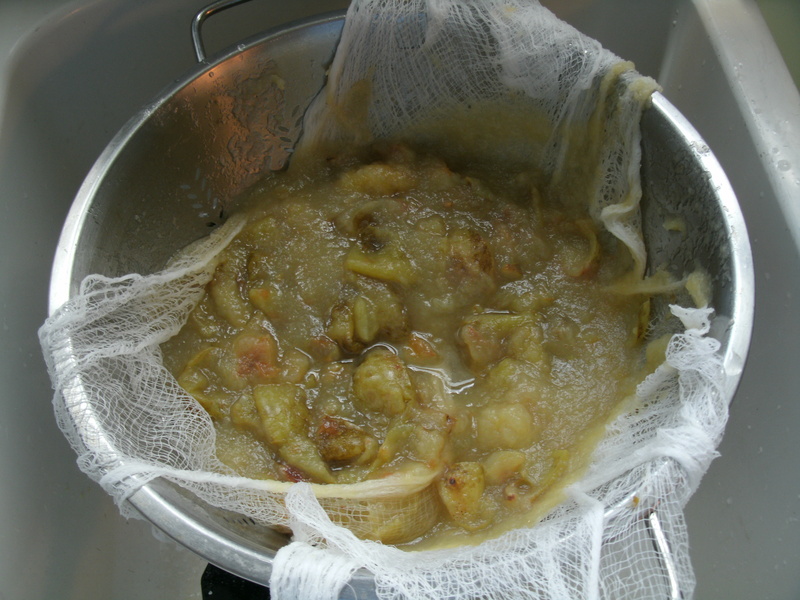 Once it appears that the apples had cooked down I strained the chunky sauce through two sheets of cheese cloth in a strainer to remove the majority of the juice. Once cooled, I pressed the juice out into a bowl. I poured the juice into half-gallon jars to let the juice separate a little more so the jelly would be clear from using only a juice with no pulp. I let it rest over night to make the jelly in the morning. The remaining thick pulp is slowly processed through the Foodmill when cool. Then I run the remaining plup through the food mill to remove the peals, seeds and lumps. 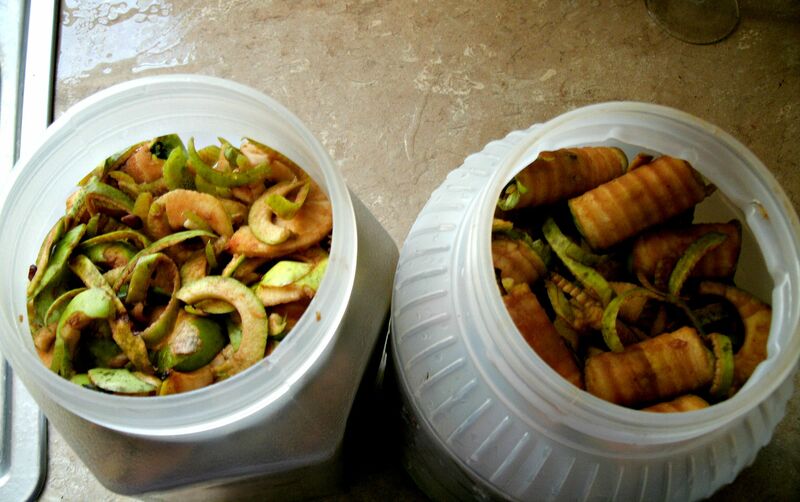 I then moved the thick sauce to two slow cookers added the sugar and some spices and covered the mixture and let cook on low for around 18 hours stirring every 4 or 5 hours.Near the end of the 12th hour I add more spices and sugar to gain a sweeter,stronger flavor. Taste testing and thickness testing is good at about 12 hours. 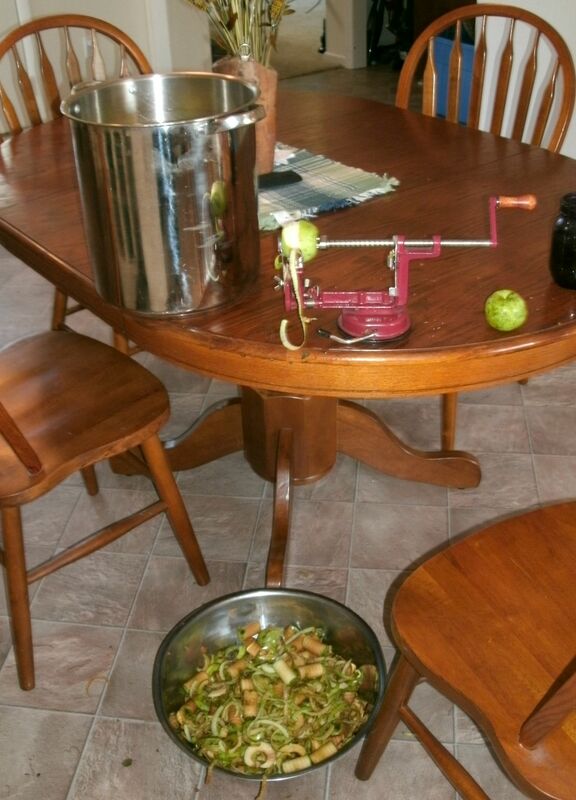 While the apple butter cooked all night and some of the next morning, I had time to clarify the apple juice. I slowly poured the juice off the top of the jars and then restrained the pulp at the bottom with 4 sheets of cheese cloth. This really cleans the juice if done slowly to remove as much of the pulp as possible. 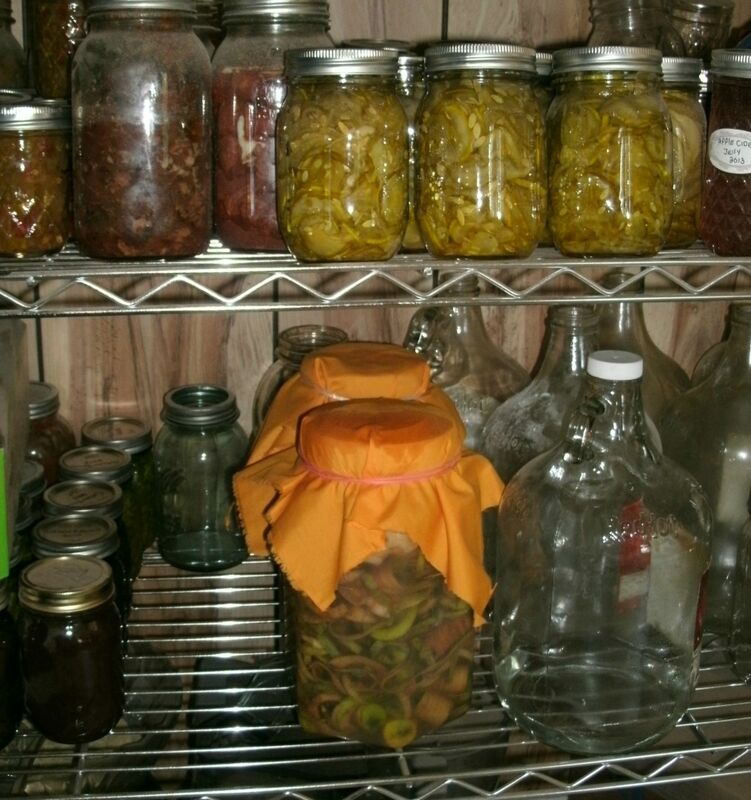 I washed out my cheese cloth between jars of juice to clear away any clogging apple bits.When I was finish straining I poured the clear juice into a stock pot to make the jelly. Measuring out 5 cups of juice at a time. As with any jelly, jam or butter you need clean sterile jars, lids and rings. I was boiling them about the same time I was pouring the juice through the cheese cloth that way they were freshly sterile and warm when the jelly was ready to ladle into the jars. The idea for this jelly came from my childhood. 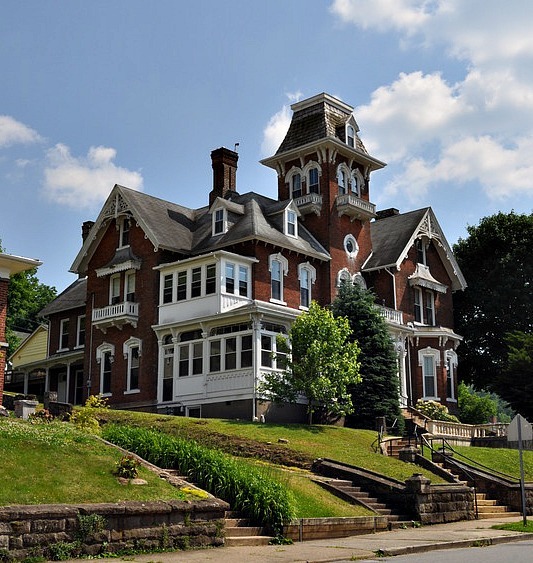 My aunt often invited my mother, brother and I over for at least one holiday dinner every year. Often it was Easter dinner and as I was so little she always offered me apple cider to drink instead of the wine that the adults drank during Easter. I loved the warm drink , she would serve her cider in a white teacup with a slice of orange in the bottom and a Cinnamon stick tipping out the top of the cup. I drank more than my fair share of the cider and wanted to make something that tasted like what I remembered as a kid and this is what I came up with. 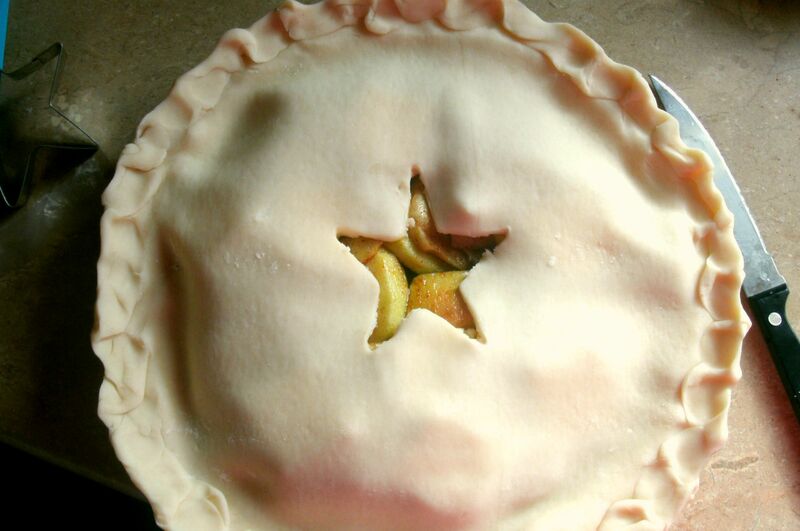 Following the basic instructions for an apple jelly recipe in the Sure Jell box you will need. 1. measure correct amount of juice into sauce pot. 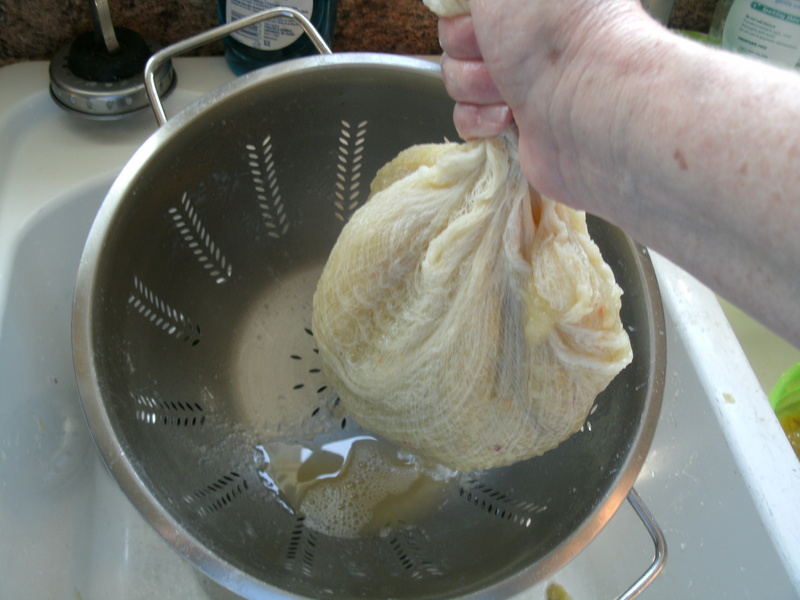 Add 1/2 teaspoon butter or margarine to reduce foaming if desired. 2. stir sugar into fruit juice bring mixture to a full rolling boil( a boil that does not go down when stirred) over high heat. 3. Add liquid pectin quickly. Return to full boil and boil for one minute exactly stirring constantly. 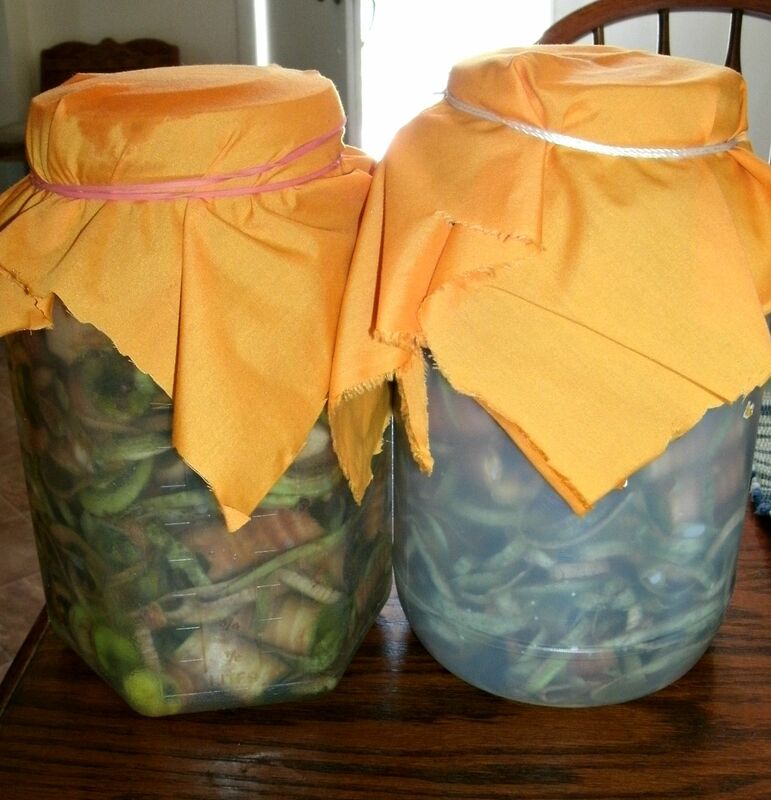 Remove from heat and ladle into prepared jars. leaving 1/8 inch head space. 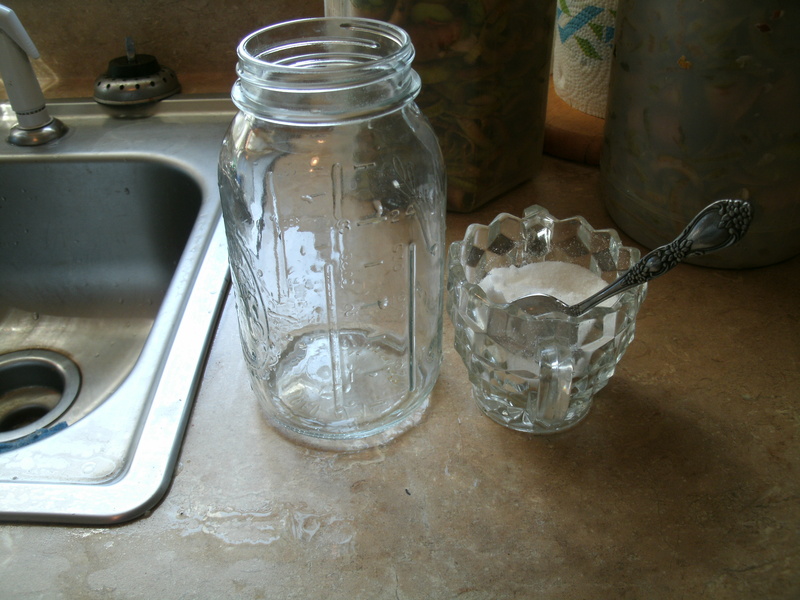 skimming tops of jars with wooden spoon to remove foam. 4. Wipe jars, add lids and rings place in a boiling water bath canner, adding enough water to cover jars with one to two inches of water. 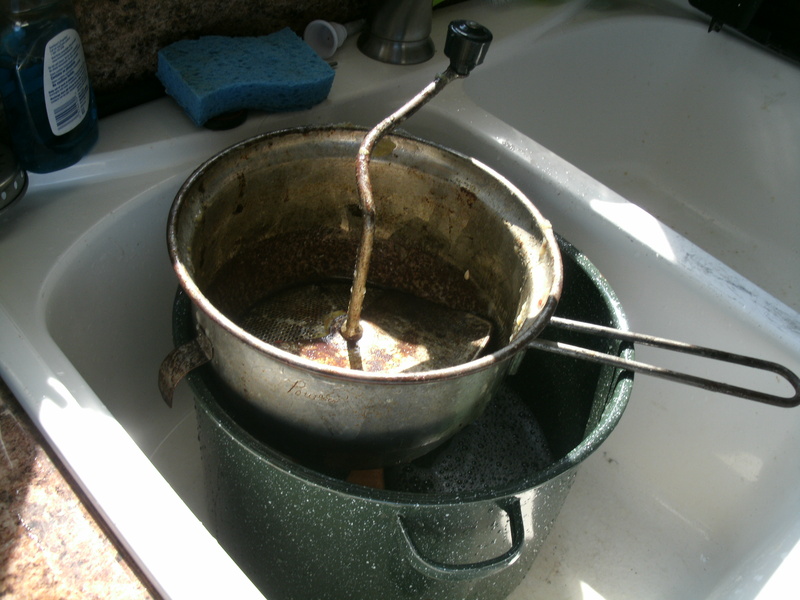 Bring to a gentil boil and process for five minutes. Remove to cool on clean towels and listen for the lids to pop and seal as cooling. Some jelly takes time to set up.. apple is not usually one of these as the natural pectin and the Sure Jell make this a firm fast setting jelly with a gold color and tiny spices mixed though out. Then as the jelly cooled I took time to look over the apple butter again. The teaspoon test is the best way to see if you apple butter is thick enough to put in the jars. 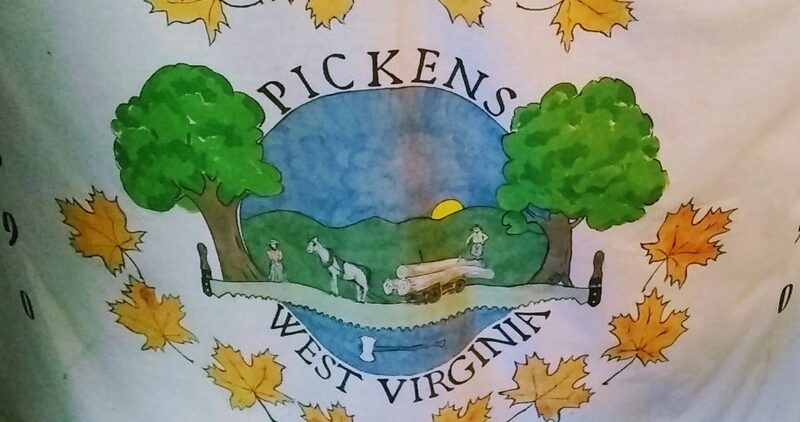 When you think the color and thickness is getting where you have reduced the apple sauce mixture about one inch inside the crock pot take a teaspoon and scoop out a small amount of the apple butter and turn the spoon side ways and see how much juice seeps out of the sauce. Ideally their will be almost no juice leaking out of the apple butter.It should be a dark almost chestnut-brown color and very thick much to thick for apple sauce. I adjust the spices and sugar about the time the juice is about gone to make sure the flavors have time to blend together.Usually a couple of hours before I stop simmering the apple butter. 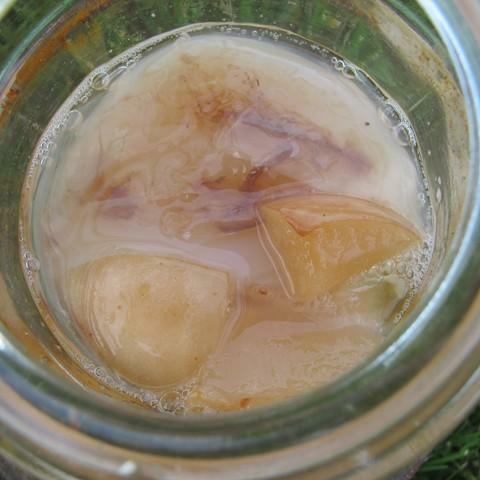 Slow Cooker Apple Butter made from Apple Sauce. 1. 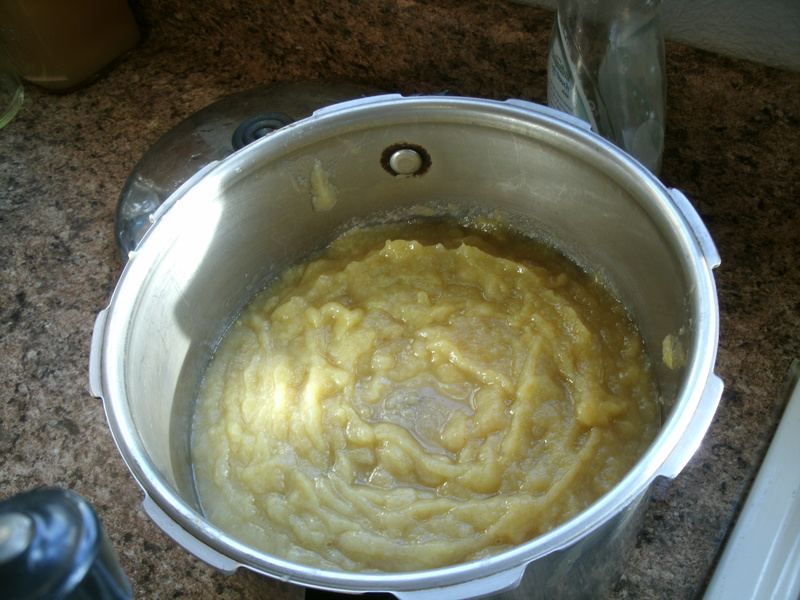 4 quarts apple sauce in a 5 quart slow cooker or 2 slow cookers with apples split between them. 2. 4 cups sugar split, three cups at beginning of cooking the other added if needed at the end of cooking. Mix together and cook on low for about 16 to 18 hours if using one slow cooker, about 9 in two slow cookers. Ladle into clean sterile jars leveling about 1/8 inch head space. Wipe jar lip and cover with lids and rings. 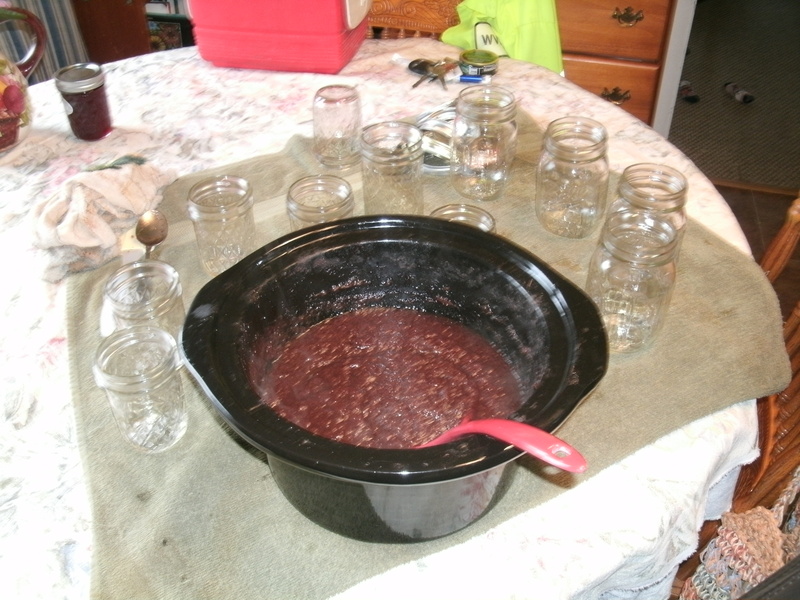 Cover jars with two inches of water and process for 10 minutes in a boiling water bath canner. 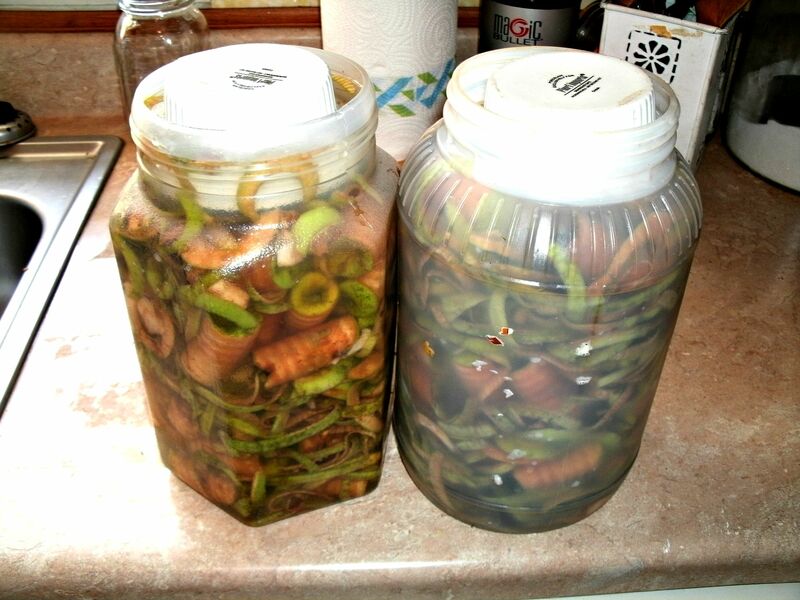 Remove jars to cool and check seals and enjoy. 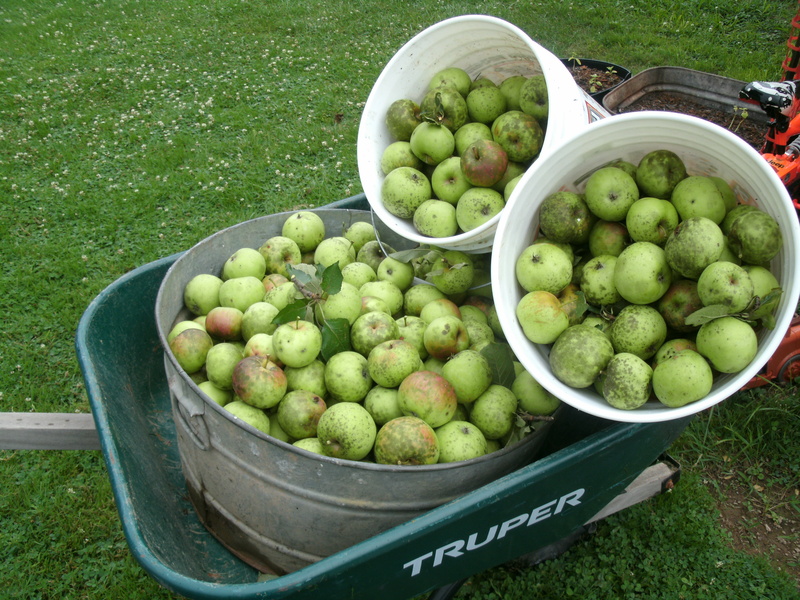 This project turned into one of the best ways I can think of to use up a large buckets of smaller apples. With a 8 quart stock pot full of cut apples I ended up with about 9 half pints of cider jelly and about 5 pints of apple butter. I repeated this process twice and had enough jelly and apple butter to give out as holiday gifts this year and still have a few for our family until the next crop of apples appears. 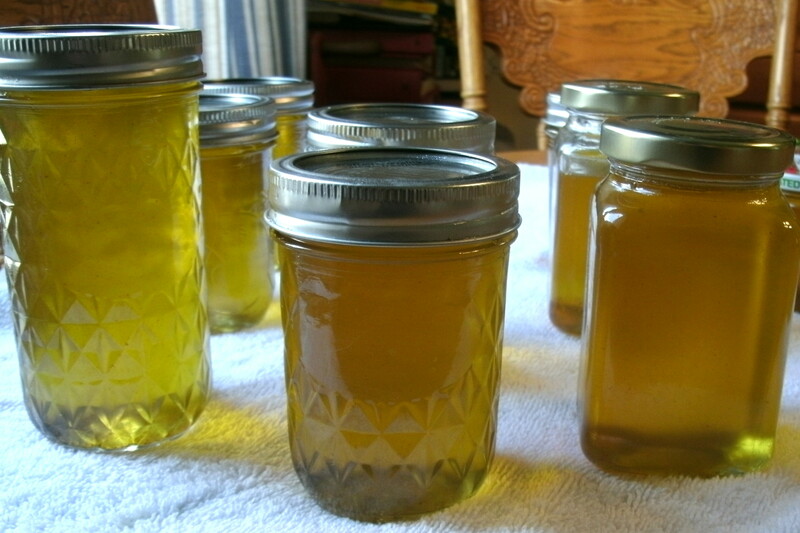 Thanks to my lovely Aunt Marjorie Snyder and her love of making jams, jellies and serving me the best apple cider ever!